G.P.S. Rolling "Handgun" Backpack features 16 removable Visual I.D. System allows the shooter to I.D. the pocket and store shooting items where they can be located easily and remove the I.D. patches for travel. 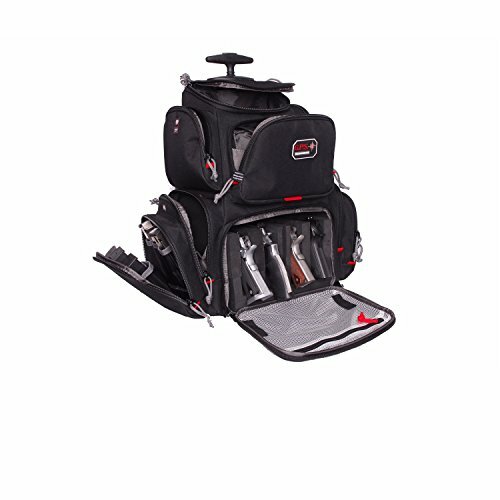 The removable foam cradle is designed to fully protect and hold 4 handguns and twin side pockets to store 6 extra magazines each. There is also a pull-out rain cover in case of a sudden downpour and lockable heavy-duty zippers to provide added security. Telescopic handle and ball bearing wheels for easy transport and storage.